The global steam autoclave market is extremely consolidated and intensely competitive. The presence of a very small number of companies commanding a vast share in the global market has rendered the market difficult to penetrate for new companies. Despite this fact, the market presents promising growth opportunities for companies introducing technologically advanced products, a trend evident from the high consumption of products based on E-beam and gamma irradiation technologies in the past few years. The vast rise in the global demand for steam autoclaves in the past few years can be attributed to the increased prevalence of a number of infectious diseases, a huge surge in surgical procedures, and an alarming rise in the numbers of hospital-acquired infections. Rising demand for improving healthcare services across developing regional markets such as Asia Pacific, owing majorly to rising healthcare expenditures and an expanding base of geriatric population. Transparency Market Research suggests that the global steam autoclave market will expand at a healthy 5.7% CAGR over the period between 2016 and 2024. The market, which had a valuation of US$1.57 bn in 2015, is expected to rise to US$2.57 bn by 2024. North America emerged as the clear leader in the global steam autoclave market in 2015, accounting for a nearly 40% share in the market’s overall revenue. Estimates suggest that in U.S. alone in the region, nearly 5 million endoscopies and about 46.5 million surgeries are undertaken every year. The severity of hospital-acquired infections in the country can be estimated from the fact that nearly 8.3 patients out of every 1,000 patients admitted in New York state hospitals in 2012 acquired hospital-onset Clostridium difficile infections (CDI). The numbers are rising at an alarming pace. These factors have collectively influenced the increased adoption of effective sanitization practices and devices in healthcare settings in North America. Strict rules aimed at enhanced safety of patients at healthcare facilities is also a major factor influencing the increased adoption of steam autoclaves in Europe, the second-largest steam autoclave regional market in 2015. The high prevalence of infectious diseases, a vast and alarmingly rising population base of geriatric people in Asia Pacific are expected to help the steam autoclave develop on a promising scale in the region in the next few years. The rising demand for high-quality healthcare services from the increasingly affluent consumer base will stimulate the improvement of healthcare infrastructure in countries such as India, China, and parts of Latin America, further driving the market. 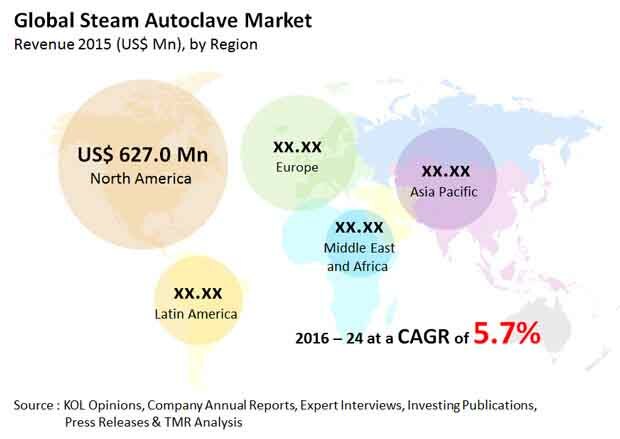 The market for steam autoclave in Asia Pacific is expected to expand at the fastest CAGR of 7.9% CAGR from 2016 to 2024 among other key regional markets. The market in Latin America is expected to exhibit the second-largest CAGR of 6.9% over the same period. Of the two key varieties of steam autoclave systems available in the market – traditional steam autoclaves and tabletop steam autoclaves, the segment of traditional steam autoclave is presently leading the global market. The segment accounted for a share of over 91.7% in the global market in 2015 and is projected to expand at the highest CAGR over the forecasting horizon, maintaining its dominance in the near future as well. The prominence of these product types can be attributed to their extensive usage in almost all major application areas such as pharmaceutical laboratories and medical devices. Additionally, traditional steam autoclaves are also considered highly efficient for sterilizing a large number of medical devices at the same time, making them more practical in large medical setups. The top three companies, which accounted for a share of over 70% in the global steam autoclave market in 2015, are STERIS, Getinge Group, and Johnson & Johnson. Other prominent vendors in the market include 3M Health Care, Matachana Group, Belimed Group, CISA Group, CISA Group, and SAKURA SI CO., LTD.